After spending half a day filing in the office I arrived home at 12:15pm to finish my preparations for Berlin (packing suitcase, toiletries, passport, etc), my parents arrived home to finish their preparations too and when finished we waited for Auntie Chris & Uncle Andrew to pick us up and travel to the airport. At the airport just before we boarded the plane we bumped into Chris Gainer and his wife and baby daughter, he sadly only had 7 weeks to prepare due to injury. We arrived at our hotel on Thursday evening a bit later than intended due to a fault on the U-Bahn, our hotel the Arcadia on the East side of Berlin which was once ruled by Communism was pretty decent with all the things you needed (bed, freezer, hot water, etc) so we were satisfied. Well my Dad was gutted at the prospect of missing the Ryder Cup. When we woke up we ate breakfast in a Pastry café just next door to our hotel. I had a Plain Croissant and a Cheesy bit of bread with a cup of tea, the family had Chocolate Croissants. After Breakfast we were joined by my Mum’s cousin Linda & her husband Markham who live in Leipzig. After meeting up it was onto the Expo to collect my race number at an old disused airport which was used in the 2nd World War. I was treated to a massage by a nice man called Lukas who also works with Hamburg SV Football Club. I collected my shirts, wristband and Powerbar products and left the expo to go and see Checkpoint Charlie. At Checkpoint Charlie we had a few photos taken although not with the soldiers on guard as you had to pay for that privilege. Nearby was a Berlin Wall exhibition which we featured a little history lesson showing the areas occupied by Britain, France, The US and the Soviet Union with pictures of life during the West/East divide. After taking in the Reichstag and the Brandenburg Gate we checked out the Fassbender-Rausch Chocolate shop which was gorgeous, I felt like a kid in a candy store (sorry). In the evening it was time for dinner at the Augustiner am Gendarmenmarkt, a German restaurant, after eating lots of Sausages and Pork it was time for bed. Saturday was spent taking a history lesson at the Holocaust Memorial which was grim and a look around the Sony Centre before hopping onto the U-Bahn and heading to Wittenberg Platz, the ladies decided to head for the shops and the fellas to the Willhelm Kaiser Memorial Church. After a hard days walking it was time to head to Charlottenburg to eat an Italian (essential carb loading). This is where we said goodbye to Markham and Linda. I ate plenty of Pasta and Garlic Bread and retired to bed early. 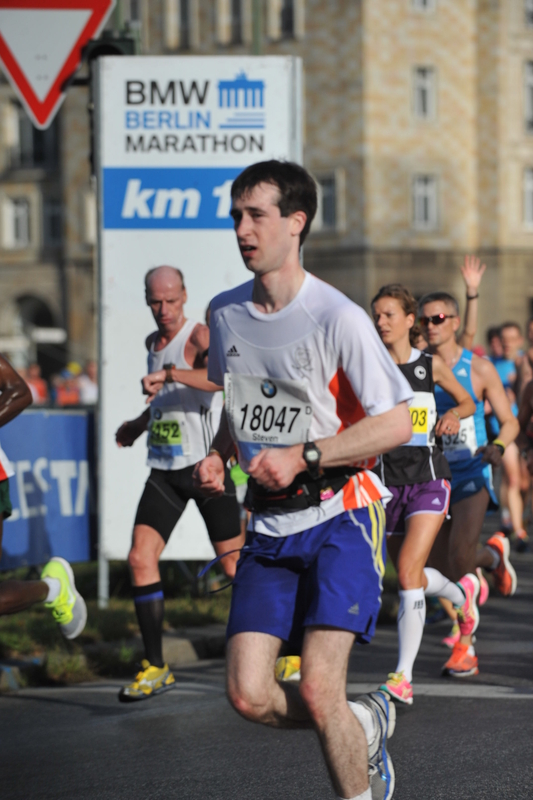 I awoke at 6:30am on Sunday Morning and dressed in my running gear complete with Race Number, I headed to the Breakfast Buffet and helped myself to Cereal with Soya Milk and Bread with Blackcurrant Jam on then made my way to the S-Bahn to travel to the race start. The trains were packed with Marathon runners all heading in the same direction and all got off the same stop. I ran into a problem though, I was stopped at the entrance because I forgot my wristband and they said you needed it to run to prevent number switching. I had to get a new one form one of the stewards but only after I called my Dad to confirm my identity, so I was allowed to pass. I started in Block D and at 1k into the race I found myself needing to stop for a toilet break. 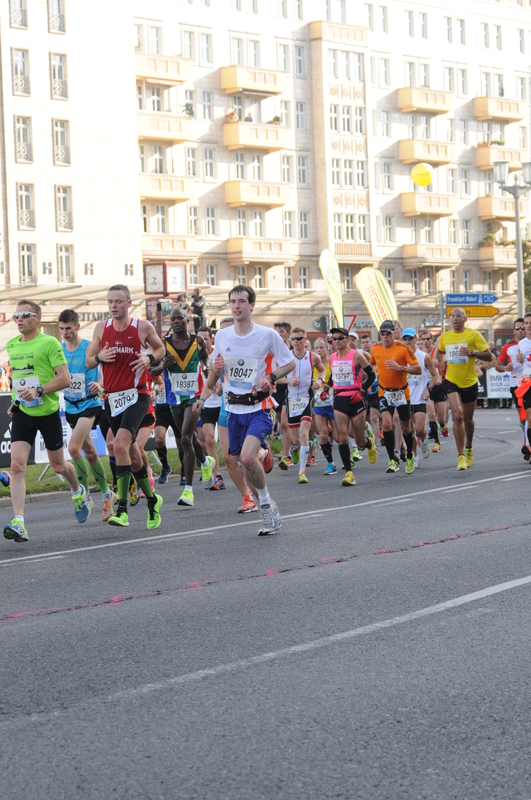 During the first few Kilometres I had the 3 hour pace makers in my sights and attempted to catch them, it proved difficult though as nearly 40,000 runners were taking part and I had to navigate my way through several of them, but I eventually succeeded and managed to pull well ahead of them. I picked up water at every stop and bananas as well to keep myself hydrated and carbed up, after an hour at the 12k mark I gorged an Energy Gel to help keep me going. Most of the race went by in a blur as most races do but after halfway I saw Matthew Davie of Mossley Hill Running Club sitting on the curb, I asked him if he was okay, he replied that he was fine, but I was worried all the same. During the last 10 or 12k I kept thinking keep going you can do this as I felt fatigue setting in, the local children kept me going by offering high fives which I duly accepted. As I turned towards the end I saw the Brandenburg gates ahead and felt relief searing through my body as the pain was about to end. 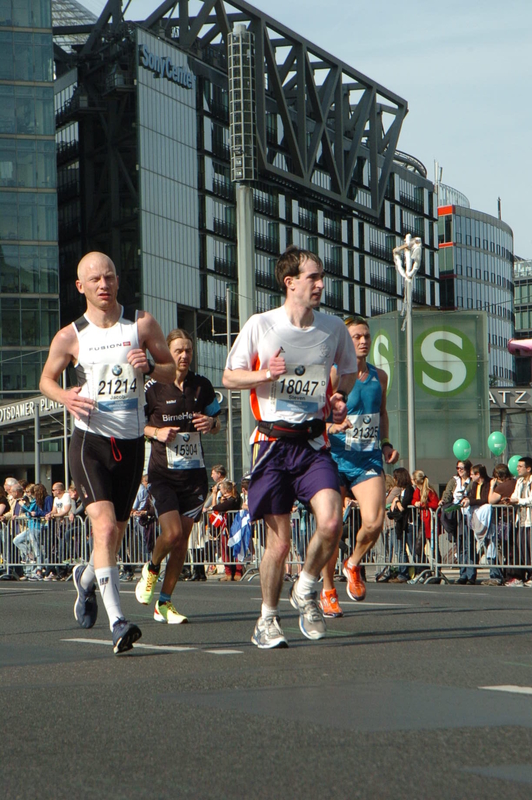 The family saw me as I passed under the gate and roared me on as I passed the finish line. I was asked by a few stewards and medical people if I was okay due to being out of breath and doing my after run stretches I replied that I was fine. I badly needed a drink and lapped up as much water as I could before meeting my family again. I travelled back to the hotel with Dad and Uncle Andrew to get a bath and into a fresh set of clothes while Mum and Auntie Chris stayed to have a coffee at the Fassbender-Rausch. When we let up again 45 minutes later my Dad was surprised to still see people running. We grabbed a little lunch and went for a cruise along the Schleusenkanal which offered some lovely views. The day was ended with a Chinese near the hotel which was lovely. picture of the Brandenburg gate which Linda painted herself as a Birthday present. Congratulations also to Chris Gainer who ran a time of 4 hours 6 minutes despite having only 7 weeks to train and Melanie Hockenhull who did her first (and last) marathon in 4 hours 50 minutes. I was unable to meet either of them but stayed in touch all the same. 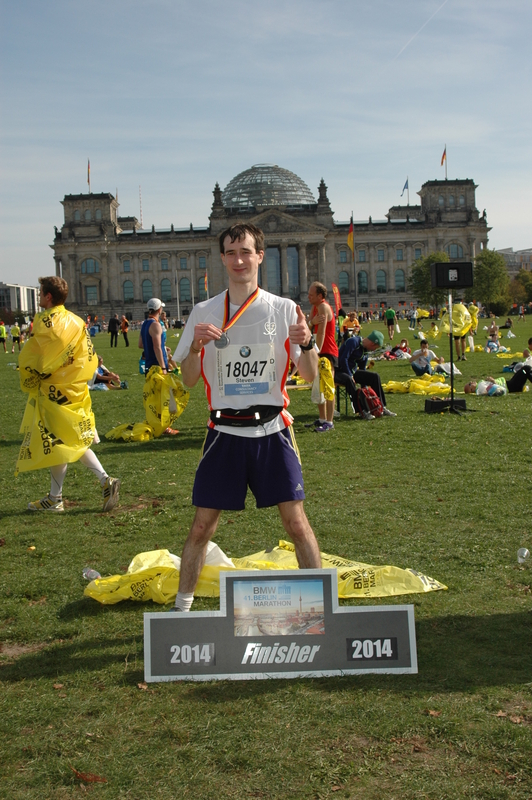 I really enjoyed doing the Berlin Marathon and would do it again and Berlin is a fab city. Well done again Steve: a lovely piece of writing too.